Something small is brewing for nuclear power in the US, it seems. At the American Physical Society meeting this week, a session that was planned months ago to address the "US nuclear Renaissance" has had its tone changed in light of the ongoing nuclear crisis at Japan's Fukushima plant. What you can frequently hear in the talks and discussions is the phrase "small modular reactors". The ethos of going smaller is surprising in light of the move toward ever-bigger plants globally - at the Olkiluoto plant in Finland a record-beating 1.6GW plant is under construction. But here it is an idea that has been gaining ground in the industry and in the halls of power for some time. Even as the Fukushima situation was at its peak, the US Secretary of Energy Steven Chu told reporters grilling him about the 2012 budget that the US position of backing small modular reactors "has not been changed" - a position he made clear in a 2010 op-ed piece for the Wall Street Journal. Attendees of the conference - ranging from nuclear physicists to policy experts - all seem to agree on the merits of SMRs. But in a country that has struggled for decades to get its nuclear Renaissance to a critical mass, talk turns quickly to economics. "Probably the biggest issue for the industry is that the upfront capital construction costs are extremely high," said Bob Rosner, professor of physics at the University of Chicago and former director of Argonne National Laboratory, the spiritual home of the nuclear reactor. "How do you reduce the upfront cost? Make them much smaller - we're talking about 100 megawatts, a power a tenth of one of the plants at Fukushima," he told BBC News. "They would be factory-built, not built on site. You could combine them, gang them together - put 10 together and you get a gigawatt plant. The point is the utility could buy into nuclear power in stages, they wouldn't have to come up with the entire cost of a gigawatt plant." What the Fukushima crisis casts light on, though, is that the SMR idea takes safety into account from the outset, said Victor Reis, senior adviser in the Office of the Undersecretary of Energy for Science. "This is a reactor that is designed safety first, not one that you do the physics first and then add the safety on," he told the conference. 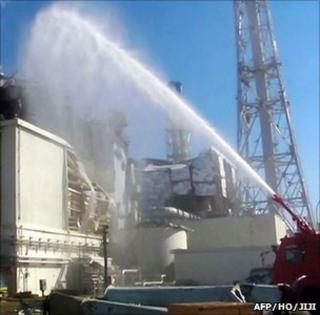 SMR designs all run on the idea of "passive safety" - that is, protective measures run without human intervention and even without power; cooling is done by natural convection, rather than with the kinds of pumps that were at the heart of the Fukushima plant's problems. They are also small enough to be built underground, making them less vulnerable to severe weather, unauthorised access, impacts, and to some degree, seismic events. These safety measures are being introduced into the latest, large-scale Generation III reactors already, and the concept is quickly becoming an industry standard. "I think the argument is less toward a small reactor per se than a reactor that is truly passively safe," said Jay Davis, president of the Hertz Foundation and former nuclear weapons inspector. "That might not be as small as the current small designs, but you're certainly going to see a push toward passive safety," he told BBC News. As much as SMRs address the large capital expenditure question, what remains to be seen is how expensive they may actually be. It is not yet clear how much, in early stages, the cost of a plant with a tenth the power output will have a price tag more than a tenth that of a conventional, large plant. "It's not obvious whether it's going to be more or less expensive," said Professor Rosner. "The fact of the matter is the only way we'll know for sure is if they're built." That will only happen if the designs get approval of the Nuclear Regulatory Commission - and firms are poised to start building if and when that approval comes. Moreover, Dr Reis told BBC News, some of the financial risk could be borne in the early days by the government. "That's where I think the Department of Energy and the Department of Defense can play a role," he said. "We can do what we did with massively parallel computing - [the US government] did the first one, we helped with the R&D, and then we were the first buyer at a sufficient scale of buying to answer the question of economies of scale." The one issue that Professor Rosner said is conspicuously absent from much of the discussion was that of the security of the nuclear material at SMRs; here again, Dr Davis says the full picture remains an unknown. "You've got to a full systems analysis, which includes going to the question: is the terrorism problem better or worse if you have multiple small reactors? You have to put all that on the table at the same time."